A terrorist attack on a mosque in Egypt’s troubled North Sinai region is the deadliest terrorist attack in Egypt’s modern history. 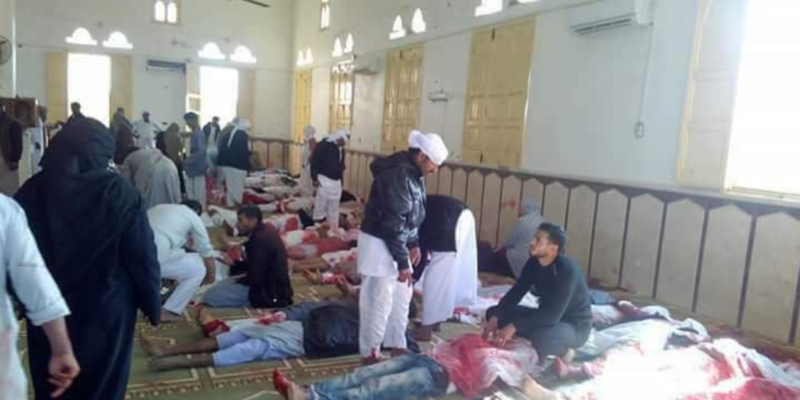 According to Egyptian state television, 305 people were killed and more than 109 injured after unidentified terrorists stormed Al-Rawda mosque with explosives and heavy weaponry. Initial reports indicate the attack involved at least one suicide bombing and heavy gunfire. If the death toll is confirmed, the attack would become the deadliest terrorist attack in Egypt’s modern history. The 2005 attack on Sharm el-Sheikh was previously the deadliest. While the 2015 downing of Metrojet Flight 9268 killed all 224 passengers on board, claims of responsibility by ISIS remain unconfirmed and the incident continues to be investigated by relevant authorities despite belief that it was most likely downed by a bomb. Since the 1990s, there have been a number of terrorist attacks targeting both security personnel and civilians. The most infamous attack in the 1990s was the Luxor Massacre of 1997, which saw the killing of 62 people by members of Al-Gama’a al-Islamiyya. In the 2000s, a string of terrorist attacks struck Egypt’s Red Sea resort towns. The first major attack on the Red Sea occurred in October 2004 when a truck bomb targeted the Hilton Taba in Taba, killing 34 people and injuring 171. Less than a year later on 23 July 2005, a number of bombings targeted Egypt’s popular resort city of Sharm el-Sheikh. The attack, which took place on the anniversary of the 23rd July Revolution, killed 88 people and injured more than 150 others. At the time, the attack was the deadliest terrorist attack in Egypt’s history. In April 2006, again targeting an Egyptian Red Sea resort city, 23 people were killed and 80 others injured after a series of explosions struck Dahab. In recent years, major terrorist attacks have targeted security forces and members of the Coptic Christian community in Egypt. There have been a number of attacks targeting Coptic Christians, three of which occurred in 2017. On Palm Sunday in April 2017, suicide bombings targeting St. George’s Church in Tanta and St. Mark’s Cathedral in Alexandria killed at least 45 people. A month later, 28 Coptic Christians were killed when masked terrorists opened fire on a bus. Attacks against security forces have occurred across Egypt. The majority of such attacks take place in Egypt’s North Sinai. According to a review by Egyptian Streets, an estimated 2100 people were killed in North Sinai in 2015, including roughly 1800 described by the military as “terrorists,” 150 civilians, 40 police officers and conscripts, and 140 military personnel. The most recent attack targeting security forces occurred on October 10. At least 16 members of Egypt’s security forces were killed in Al-Wahat in Egypt’s Western Desert when security forces raided a terrorist hideout. The most damaging recent attack on Egypt’s tourism industry, however, was the downing of Metrojet Flight 9268. The airplane crashed in Egypt’s Sinai, killing all 224 passengers on board. ISIS claimed responsibility for the crash. However, while an explosion is thought to be the most likely cause of the incident, no perpetrators were ever caught and the incident remains under investigation. Egypt has called for an international response to terrorism in recent years, with Egypt’s President Abdel Fattah Al-Sisi using Egypt’s position in the region to rally the international community. Along with calling for a unified response, President Sisi has called for the reform of religious discourse to tackle religious extremism and terrorism.